Staunton and Cochrane played over 600 games between 1841 and 1843, mostly in 1842 and although only about 1/5 of them were preserved, those approximately 120 games show Staunton scoring about 2 to 1. According to Spinrad's article on Cochrane at ChessCafe (p.3), Cochrane was unhappy with Staunton publishing too many of Cochrane's losses, but he refers especially to the last match they played even, which Cochrane won +3-1=2. Staunton claimed (Illustrated London News, 9 July 1864, p.47) that the preserved games do not indicate the relative proportion won by each player. Although he does not say so explicitly, the suggestion is that Staunton's proportion of wins was higher than would be indicated by the preserved games. In the 27 Feb. 1864 issue of the Illustrated London News (p.219), Staunton says, apparently in reference to his games against Cochrane, that he won 'an enormous - an almost incredible - proportion of the six or seven hundred games played'. With Cochrane complaining that Staunton printed too many of his losses, and Staunton claiming that he won more than those published would indicate, it is impossible to say what bias there was if any in the published record. I have found 119 games played even between them (plus one fragment whose result is not given). The score amongst those games is +73-34=12 for Staunton. Part of this score, though, is accounted for by games from two even matches in 1843 listed separately here. In one of those, Staunton won +14-4; the other was +1-3=2. Previously, I approximated the result of their earlier games (mostly played in 1842) by the remaining published games, i.e., by subtracting the total of the last two matches, +15-7=2, from the total for all games found of +73-34=12 to get +58-27=10, which I used. 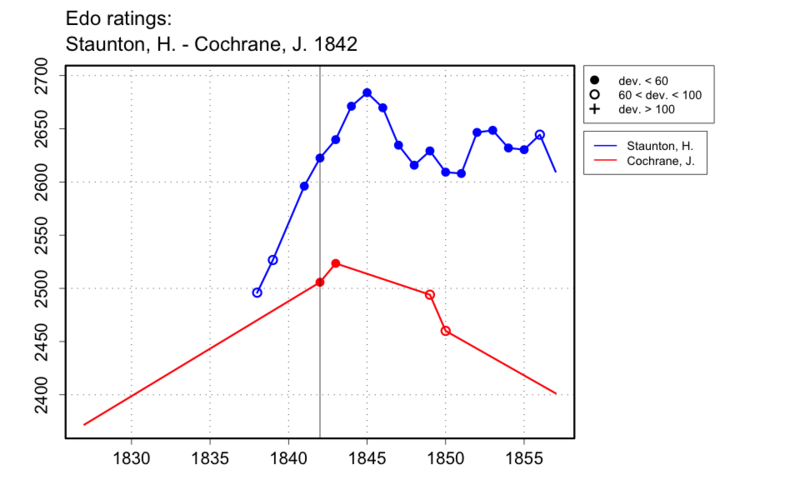 However, this indicates more certainty in the relative score between them than we really have, and my sense is that while Staunton could be misleading, he did not lie outright about factual matters, so the proportion of his wins against Cochrane probably was, indeed, higher than 2 to 1. Excluding the last two matches, we know Cochrane got at least 32 points (27 wins, 10 draws), so more than 5 percent of the 600 games. As a soft result that is consistent with these observations, I will use +4-1 for Staunton, which gives Cochrane 20 percent and asserts that he got more than 10 percent (0.5/5) and less than 30 percent (1.5/5). This is consistent with what we know without exaggerating the precision of the information.